A lot of people have asked what is the difference between Server 2012 Standard and Essentials, and then the difference again when an Essentials box is transmogged. I don’t know of any official resource available from Microsoft that answers this question, so i made a little chart. This is just based on the ‘Windows Features’ built into the underlying OS and does not include the Essentials ‘Value Add’ features like Client PC Backup, the RWA and so on. First, i have 3 servers. My Server 2012 Standard is a VM, plain out of the box install. My Essentials box is based on the RTM ISO, and is what i would call ‘fully configured’ i.e., i have setup the RWA and enabled DirectAccess. Finally the Transmogged server is an Out of the Box install of Essentials RTM – with little customisation. 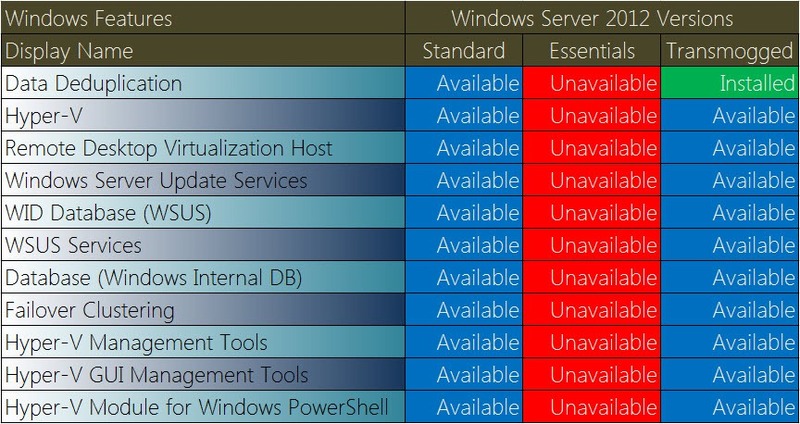 These are the features that are unavailable in an Essentials server, compared to a full Server 2012, or a transmogged Essentials Server. Remember once your Essentials Server is transmogged and things like Hyper-V or RDS become available – it is still a Domain Controller, and as such you should exercise caution when enabling any additional roles. You can grab a copy of the full comparison spread sheet from here. Will S2012 Essentials allow me to install a third party security certificate like from Godaddy?